Evolution Gaming is the world’s leading provider of live dealer online casino roulette games, working with more top end casinos than any other provider in the gambling industry. The company was formed in 2006 in Riga and since then have revolutionized online gambling, enabling players to take a virtual seat at a real-time live dealer casino games. The games are streamed live to your desktop, your laptop or your mobile device, all in TV quality video so you can bet in real time. Evolution Gaming provides the live casino platform to a long list of online casino. Some of them include the industry leader such as 888 Casino, William Hill, Unibet, Betclic, Betsson, Bwin.Party, Grosvenor Casinos, LeoVegas, Lottomatica, Mr Green and Sportingbet.com. In Malta, the company hosts the international dealer team with a wide range of native speaking dealers which enables the licensees to offer a more personal service for their players. Riga, however, is the largest location, operating more live tables than any other land based operator in Europe. From here, the company offers both the generic live tables which allow licensees branding and the ability to set their own betting limits and the bespoke dedicated tables, offering even greater branding and customization. The dealer will be multi-lingual and speak the language relevant to the market the casino is aimed at. You’ll be able to interact with the dealer whilst playing using a chat box, the dealers being friendly and only too happy to reply on screen verbally as they’ll not have access to the chat box. When entering an online casino, you might find the live casino integrated into the other games offered by an individual casino; however, some online casinos will offer the Evolution Gaming Live Casino separately from the virtual casino. Having headed to the live casino you will be met by the selection of games on offer and clicking on one will see you taken to the table with a live dealer. There are two views available when playing live casino roulette. The classic view offers the betting area and your chips at the bottom of the table with the dealer and the table in a window above. The 3D view is the view you would have if you were standing at the far end of the table from the wheel in a real casino. 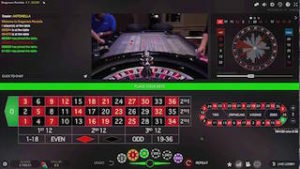 Along with the views, you’ll have various options, including the ability to zoom in on the wheel during the spin, change the video quality of the stream or bring up a history of the results of previous spins. Live Roulette – The standard offering is the live roulette, offering the chance for players to set up their own favorite bets (up to 15) to simplify the betting process. This game offers a blend of live action, an optimized betting interface, and faster gameplay. Mobile Live Roulette – This particular game is available for iPad, iPhone, and Android devices and offers the same action as the Live Roulette tables but optimized for mobile devices. 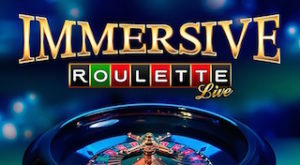 Immersive Roulette – it offers perhaps the most interesting Live Roulette experience. This features multiple camera views automatically cutting from camera to camera, all in high definition, so the player feels at the heart of the action. When the ball finally comes to rest in a slot, you’ll see a slow motion replay of the moment, for some added tension. This version of the game also offers enhanced statistics. Mini Roulette – This roulette game offers the game in a much smaller window (just 200×200 pixels) offering the player the chance to play multiple tables at once. Sports Roulette – it offers a live sports TV studio atmosphere to your game of Roulette. As the action is ongoing at the table, the dealer will discuss the day’s latest news and live happenings in the world of sport. You’ll also be able to interact with other players through the chat box, making this a lively table full of banter when a major sporting event is ongoing. Slingshot Auto Roulette – This game variation is a fast action game offering between sixty and eighty spins an hour. This game features an advanced, fully automated wheel with no dealer – perfect for the player who wants fast paced action with fewer frills. The online casino that offers the opportunity to play online roulette via Evolution Gaming software is well known 888 Casino. It also has been reviewed by the members of BestRoulette.net which you can find by visiting this 888 Casino Review. They have easy deposits, generous roulette bonus and a great selection of single zero roulette games to play for real money online. Check out 888 Casino to play live dealer roulette online! Evolution Gaming aims to bring the customer as close as possible to the action you’ll find in a real-life casino – featuring interaction with professional dealers and other players at your game of choice. Evolution Gaming offers the same casino experience when playing live dealer Blackjack, Baccarat, Casino Holdem and Three Card Poker at live dealer casinos.